We were the first, in these columns, to publish the first rendering of this new project under construction at Lürssen. And today, we publish the first picture of her casco completed. 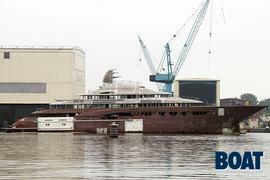 At 11:00AM the 88m hull was launched to be transfered into another shed. It was the opportunity to see this yacht for the first time. Being built to a design by Nuvolari & Lenard, she will accommodate 12 guests in six staterooms and is scheduled to be launched in 2012. Construction of Bellissimo is being overseen by Moran Yacht & Ship on behalf of a repeat client.